Bill George is professor of management practice at Harvard Business School and the author of the best-sellers True North and Authentic Leadership. He is former chairman and CEO of Medtronic; under his leadership, Medtronic's market capitalization grew from $1.1 billion to $60 billion, averaging 35% per year. Earlier in his career, he was an executive with Honeywell and Litton Industries and served in the U.S. Department of Defense. He currently serves as a director of ExxonMobil and Goldman Sachs, and also recently served on the board of Novartis and Target. He is a trustee of Carnegie Endowment for International Peace, World Economic Forum USA and the Guthrie Theater. He has served as board chair of Allina Health System, Abbott-Northwestern Hospital, United Way of the Greater Twin Cities, and Advamed. George has been named one of "Top 25 Business Leaders of the Past 25 Years" by PBS; "Executive of the Year 2001" by the Academy of Management; and "Director of the Year 2001-2" by the National Association of Corporate Directors. He has made frequent appearances on TV and radio including Charlie Rose, The Today Show, News Hour with Jim Lehrer, NOW, CNBC, Bloomberg News, and NPR. His articles have appeared in Wall Street Journal, Business Week, Fortune, Harvard Business Review, and many others. George received his BSIE from Georgia Tech, his MBA from Harvard, where he was a Baker Scholar, and honorary PhDs from Georgia Tech and Bryant University. He has been a professor at IMD International and Ecole Polytechnique (Switzerland), and executive-in-residence at Yale School of Management. He lives in Minnesota, Massachusetts and Colorado. Introduction The Ultimate Test of Your Leadership. Lesson #1 Face Reality, Starting with Yourself. Lesson #2 Don't be Atlas, Get the World Off Your Shoulders. Lesson #3 Dig Deep for the Root Cause. Lesson #4 Get Ready for the Long Haul. 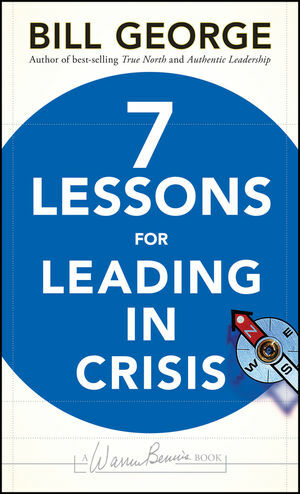 Lesson #5 Never Waste a Good Crisis. Lesson #6 You're in the Spotlight: Don't Lose Track of True North. Lesson #7 Go on Offense, Focus on Winning. Conclusion Crisis May Be Your Defining Moment. Appendix Leaders Featured in 7 Lessons.